This is quite astute, to the point, and unassailable! That guarantees neither she nor her clueless snowflakes will remotely entertain it. I know many people RW included thinks this ground swell of socialism is something you can address. But wasnt it Doug Casey who said you cant debate stupidity? Where did you ever get the idea that I wanted to move the masses by discussing the regression theorem and marginal value product? and then see my post that will be up on Wednesday. 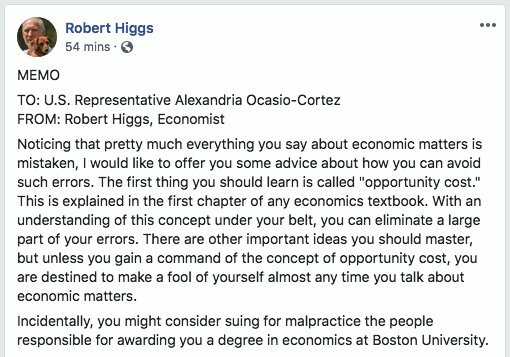 Dr. Higgs is a treasure. We are all blessed to have him with us.